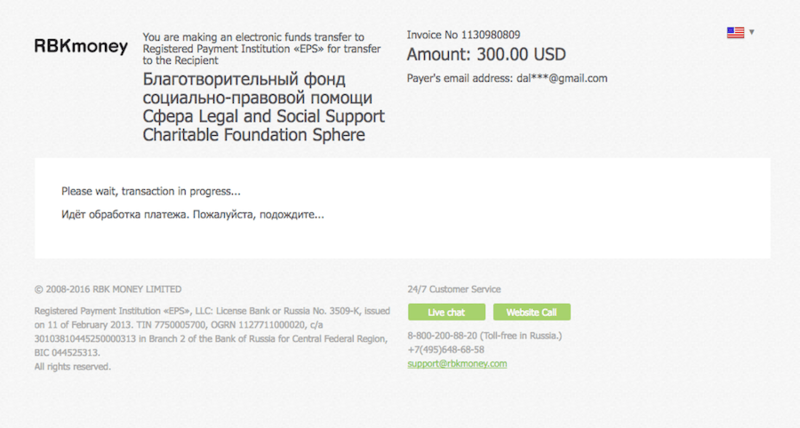 But thanks to the generosity of my readers, I made a $300 donation to the Russian LGBT Network in April. This enabled me to take screenshots of the entire process. You can download a PDF of these instructions at the end of this article. And please make a donation. It takes less than five minutes to save lives. 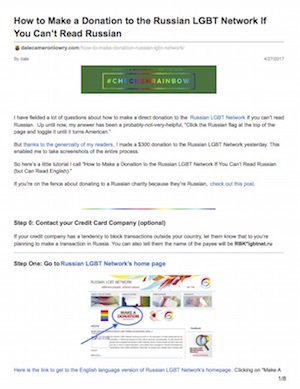 To learn more about the Russian LGBT Network, or if you’re on the fence about donating to a Russian charity because they’re Russian, check out this post. 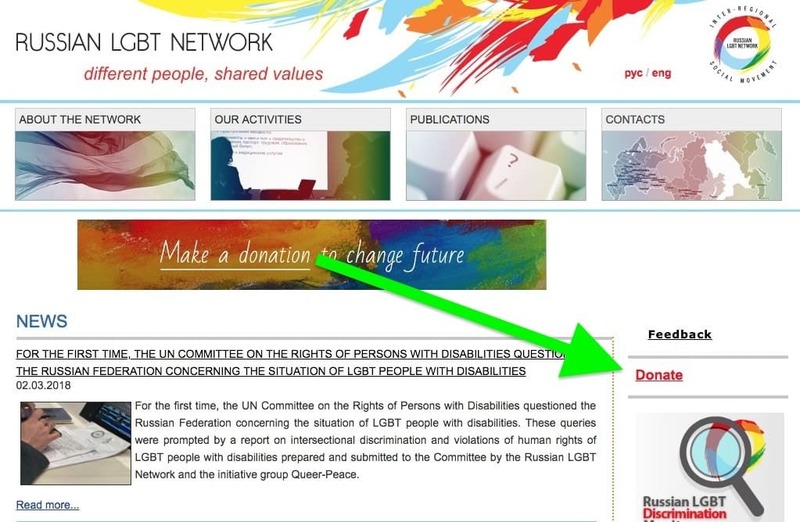 Update: In response to an outpouring of international support, the Russian LGBT Network has added other methods of donating through its website since I originally posted this article. 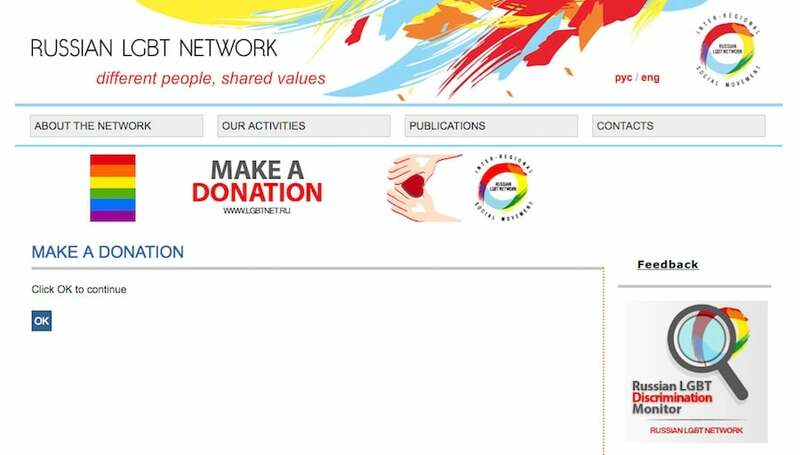 The one below still works for general donations you don’t want to earmark for a specific project. If you want to earmark your donation, you should go instead to the English language homepage and click on Donate in the right sidebar. Double click on any screenshot in this post for a larger image. That will open a menu of projects to choose from. Click on the one you want and follow the screen prompts from there. Make sure to call your credit card company before to let them know you’re planning to make a transaction in Russia. If you have trouble understanding the prompts, come back and use the method below instead. Here’s a link to get to the English donation page. 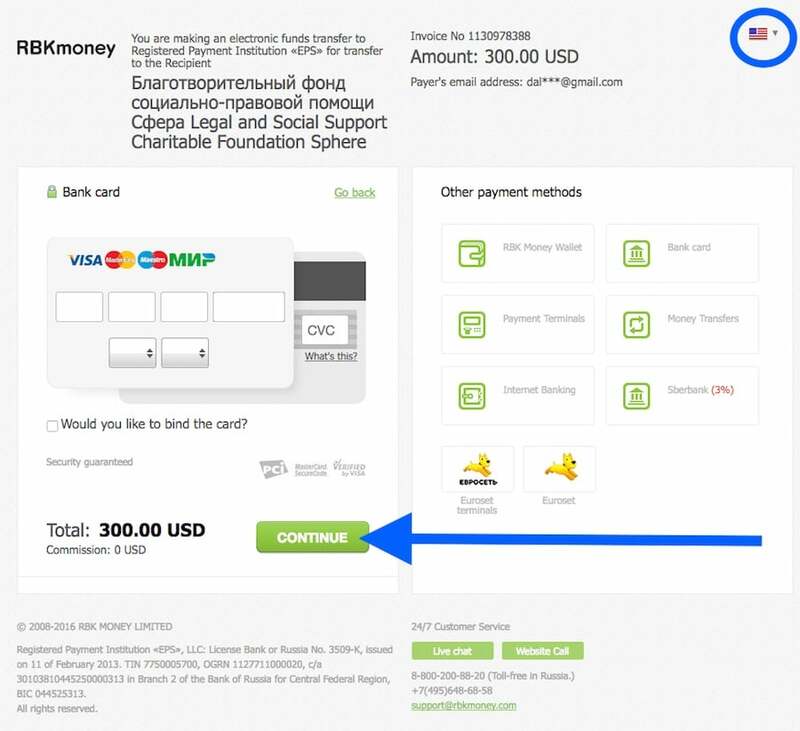 Below the Donate Now button, there is additional financial and banking information about the charity if you’re curious or you want to make a direct transfer by visiting your bank instead of via the web. 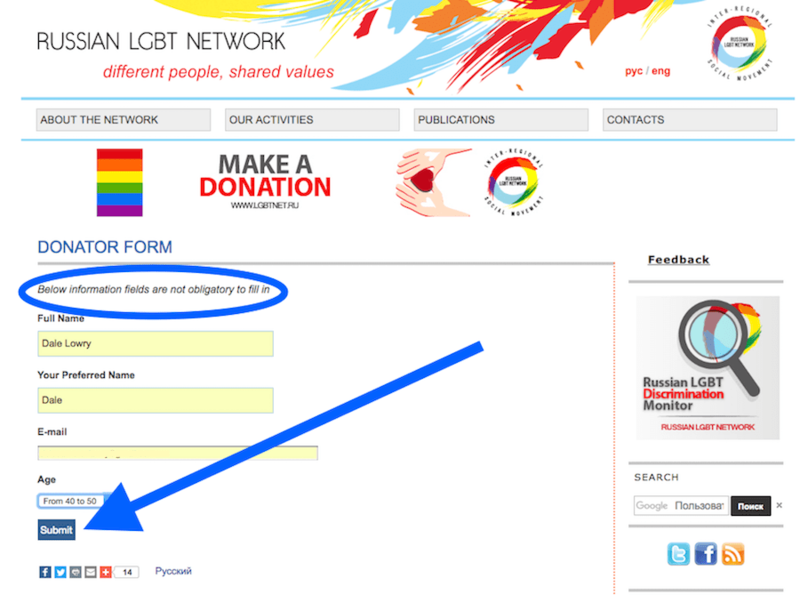 Fill this out if you want to get a thank you email from the Russian LGBT Network. Otherwise, just click Submit. The next screen has no discernible purpose other than checking that you can click a button. Go ahead and click that button anyway. 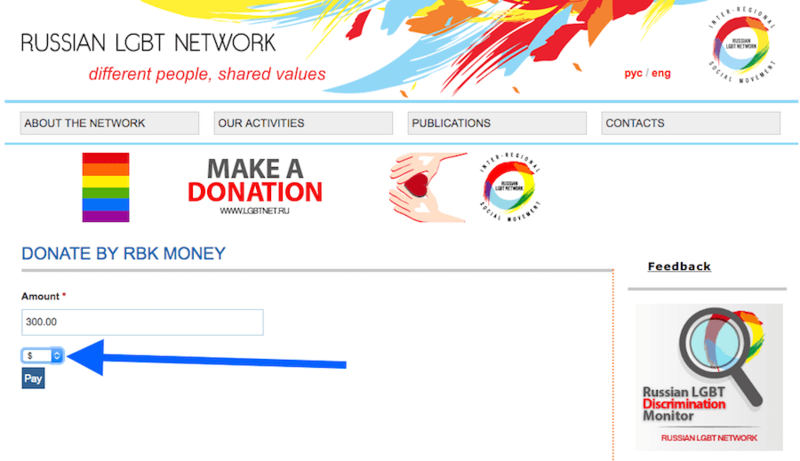 There’s a field where you can enter the numerical amount of your donation. Below that is a menu that allows you to select from three currencies: rubles, euros, and US dollars. Then hit the Pay button. 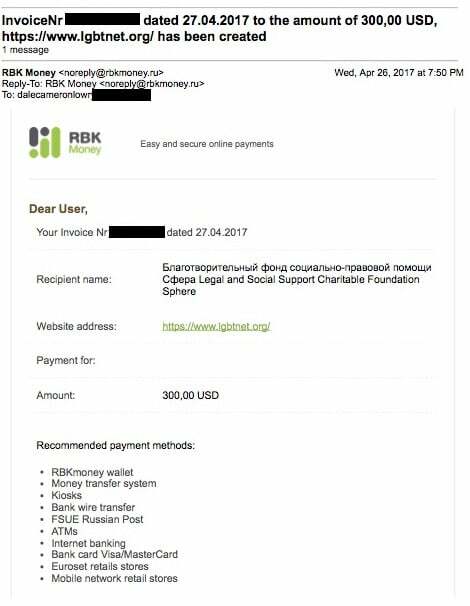 Enter your email so that RBK Money can send your receipt once your transaction is complete. Then press the Continue button. If you have used your credit card online before, this page should be pretty self-explanatory. RBK Money wants your credit card number, expiration date, and three-digit security code. Enter all that, check that the amount of money and currency is correct, and press continue. if for some reason this page switches to Russian, you can switch to English the same way you did on the previous page, by changing the flags through the menu at the top right of the screen. When processing is complete, RBK Money kicks you back to the Russian LGBT Network’s website. 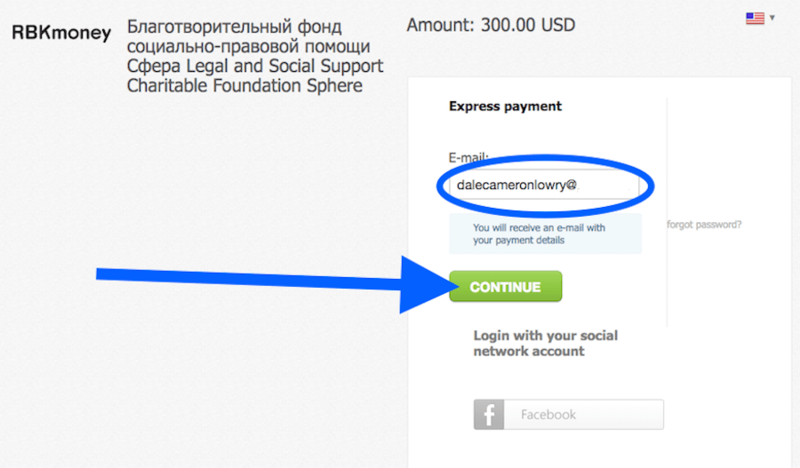 You will get a short message in both English and Russian telling you whether your transaction went through. The rest of the page is, however, in Russian, so if you want to continue browsing the site, just go to the top right again to switch languages. Note: The first time I tried to donating to Russian LGBT Network, I got a message that my transaction did not go through. I fixed this with a quick call to my credit card company, which had blocked the transaction because it didn’t expect me to be doing business in Russia. You can prevent a rejected transaction by calling your credit card company first. That’s the reason I listed Step 0 at the beginning of all this. 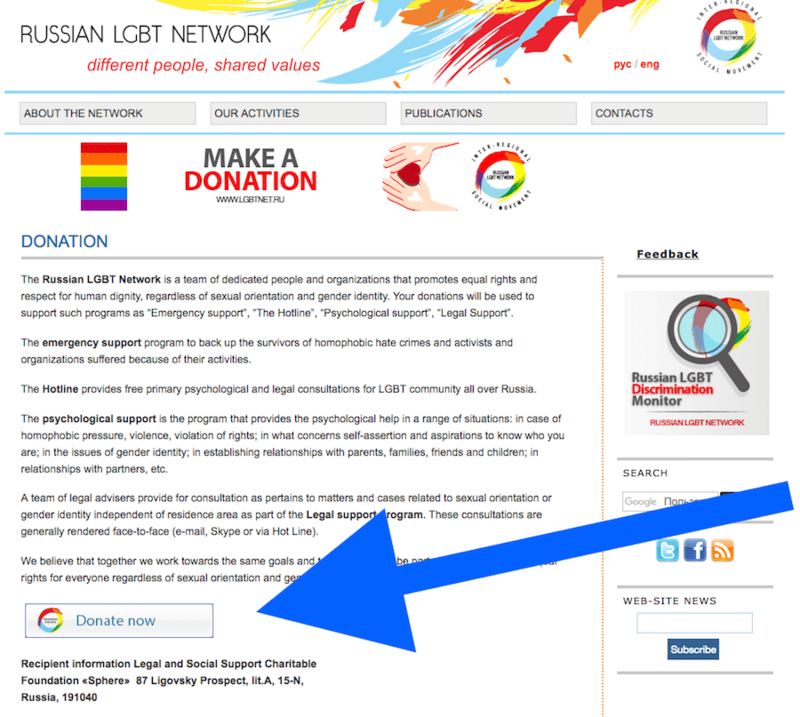 The team of the Russian LGBT Network is very grateful to you. And that’s it! Just five to ten minutes of your life to help someone who really needs it. I hope you found this tutorial helpful. If you’re on Tumblr, please reblog the Tumblr version of this post. And let me know in the comments section if you have any questions. 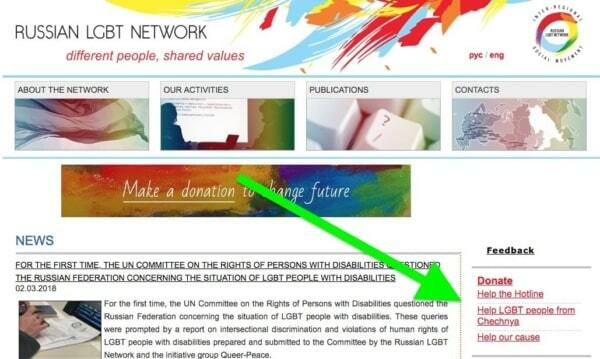 If you end up sending a ton of money to the Russian LGBT Network, I won’t mind at all. Interested in learning more ways to help? Check out Readers & Writers for LGBT Chechens.